The Jon Renau Hairpiece Collection is unique and diverse, offering exciting and easy to wear looks for everybody. 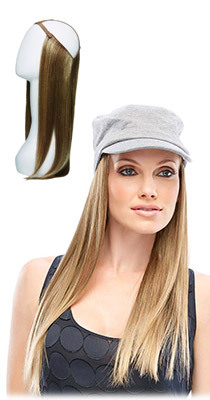 These high quality synthetic hairpieces come in the latest styles and colors. Breathless is a medium length straight ponytail attached with a convenient claw comb and drawstring. • Overall Length: 8 - 10.5 in. Classy is a great short and wavy claw comb attachment instantly creates an exciting look. • Overall Length: 5 - 5.5 in. The Fun Bun is a drawstring curly attachment. Create a beautiful, elegant up-do in seconds using this elastic wavy bun attachment. Wear it high or wear it low! Hat Magic is an extremely versatile piece made to wear under your own hat. The long fall easily attaches over the head with cross-over elasticized bands (hat not included). • Overall Length: 19 in.